Presently we are living in a so-called electronic-dominated world. On one hand there is fast growth and development in science and technology. There is a gradual shift of population from rural areas to urban areas which is resulting in non-stop construction of high-raised buildings, villas, gated communities and so on and so forth. Gone are the days when people used to lead a natural life in communion with nature in natural surroundings / environment. I personally feel that we are inclining towards an artificial life with too much materialism. With the ever increasing trend of home decor a majority of people are inclining towards creating a natural surroundings in their home in an artificial way. We make artificial bird houses and keep in the balconies. I don't think these will provide a natural shelter to the poor birds. In Hyderabad one can see flocks of pigeons all around particularly in KBR Park, Jubilee Hills and in Charminar area. In Banjara Hills too there are flocks of pigeons that keep cooing during the day. Mostly these pigeons sit in the window sills of our bedrooms and at times enter inside the room. They then get panicky and couldn't find the way out. With great difficulty we have to show these cute guests their way out. Once a fast growing baby pigeon entered our home and literally flew hither and thither in panicky. With great difficulty I could capture the it's image in my mobile and as always we helped the little one to find it's way out. 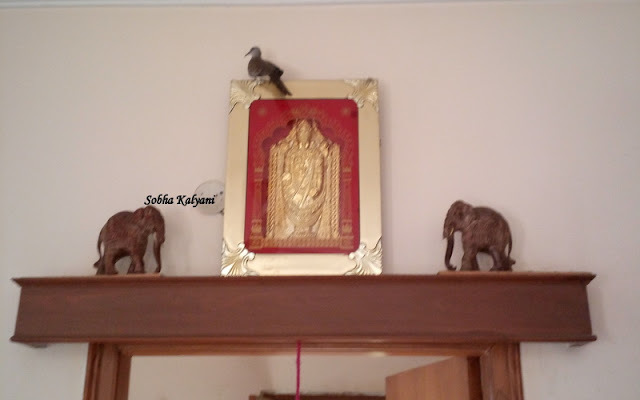 Last year in 2018 on returning from a temple at around 8 p.m, I went into the kitchen for preparing dinner when I heard strange chirping of a bird. 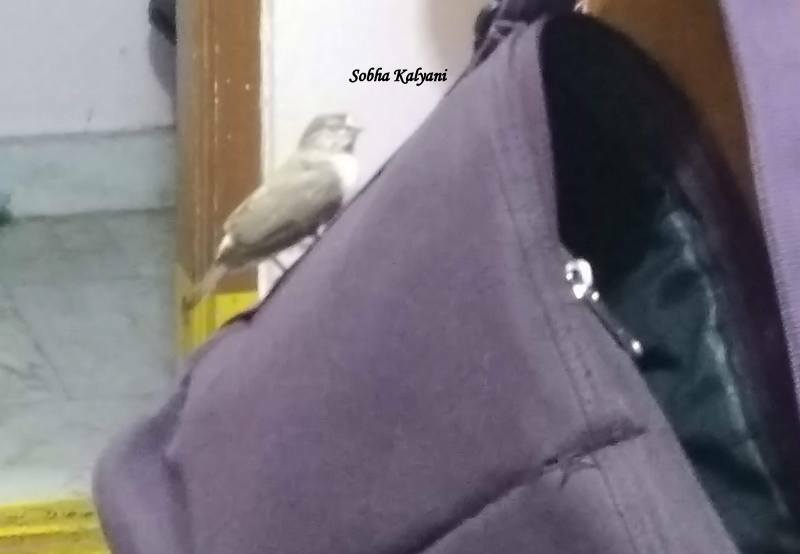 And I was surprised on spotting this little baby sparrow perched on the bag. I immediately took few clicks of this untimely strange guest at our home. I think the poor creature was lost and was shivering. We called our watchman and asked him to take it out carefully and leave it on the terrace. Today (8.3.2019) when my daughter was busy doing craft work in her room she heard some strange chirping of a bird. She spotted a myna sitting on the window sill and she called me immediately. 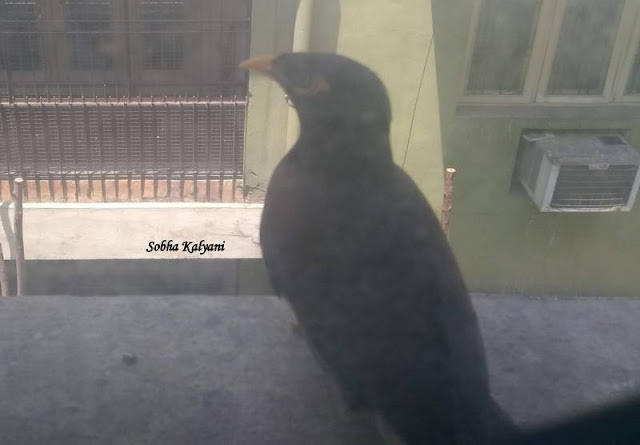 She didn't know that it is a myna as she has never seen one before. As and my daughter, both, are bird-lovers and also animal-lovers, I immediately captured the pics of this little guest to our home in my mobile.